Did you experience déjà vu hearing today’s gospel reading? It’s only a couple of months since we heard another version of the story of a woman anointing Jesus with expensive perfume. 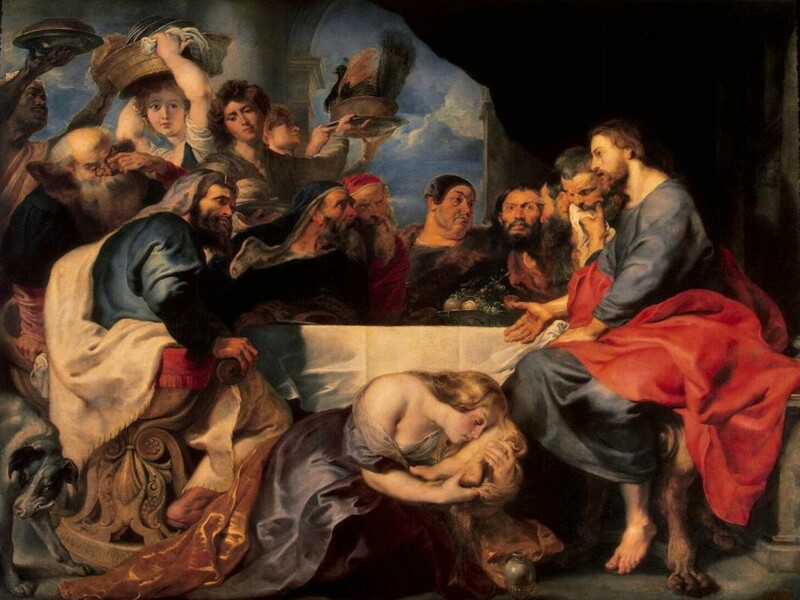 On the fifth Sunday of Lent we heard John’s account, a story in which Mary of Bethany takes a pound of costly perfume, anoints Jesus’ feet, and wipes them* with her hair. In that story, Mary is anointing Jesus for his burial. As I said back then: ‘In less than a week, the man who is now sitting and eating with disciples and friends will be dying on a cross.’ That was central to that story. Today’s story is different. It occurs in the middle of Jesus’ ministry, long before his death. The woman anointing him isn’t one of Jesus’ disciples but an unnamed woman of the town. Like John’s version of the anointing, this story is a story of God’s love, but rather than that love being shown in Jesus’ death, it’s shown in forgiveness and hospitality. We need to set the scene. Luke shows us Jesus dining, Greco-Roman style, in the home of a prominent religious leader named Simon. In Jesus’ day, there were no paved roads, no socks, and no running water. So it was expected that a host would provide guests with a servant to wash their feet on their arrival, as well as providing some scented ointment for their hair. We see this in John’s story of the Last Supper, when Jesus washes his disciples’ feet and tells Peter: ‘One who has bathed does not need to wash, except for the feet, but is entirely clean.’ Since Simon had invited Jesus to dine, he should have provided a servant to wash Jesus’ feet before Jesus came to the table so that Jesus would be entirely clean. It seems that Simon didn’t. In Greco-Roman dining, cushions or couches were placed alongside low tables, with the guests reclining on them. This is why it was possible for the woman to come up behind Jesus and begin to anoint his feet and wipe them with her hair. We don’t need to imagine her crawling under a table. Nor do we need to imagine her breaking in, houses in Jesus’ culture was so constructed that the woman could have simply walked in. However, only men would eat together, while women would enter the room only to serve the food. They wouldn’t talk with the men and would never touch a man in public. So, while this woman hasn’t broken in to Simon’s house, she is violating social standards of respectable behaviour for a woman by simply being in the room. Respectability probably wasn’t a big concern for this particular woman, who was a sinner. In the Jewish context, the description ‘sinner’ would indicate someone who was not faithful to God’s law – someone who transgressed the Torah. We don’t know anything specific about her particular sin. It’s routine for commentators to assume that she’s a prostitute, as if the only sin a Jewish woman of the first century could commit would be a sexual sin. We don’t know that! Luke doesn’t tell us what her sin is, just that her sin was well-known. The shocking actions of this well-known sinner now go beyond her simple entrance into a room where men are eating, to something even more outrageous. She washes Jesus’ feet with her tears. She touches him with her hair. She anoints him with ointment. But then, she’s already a woman with a bad reputation. She has no ‘good name’ left to lose. But what about Jesus? Any proper man would have reacted with outrage and anger at her behaviour. A respectable man would have rejected her for touching him in public. By allowing this behaviour Jesus is tainted by the woman’s sinful reputation and brings dishonour on his host. Simon the Pharisee, quite naturally, disapproves. Clearly Simon’s face reveals his thoughts, and Jesus responds by telling a parable about two debtors, both forgiven. The one who had been forgiven much, loved much. The implication is that Simon should have seen this notoriously sinful woman, who is showing so much love, as someone who has been forgiven much. But Simon didn’t see that, because he didn’t really see the woman. Rather than seeing a woman expressing love, Simon saw a ‘sinful woman’ who was a nonentity in his religious worldview. She was a known sinner, and so Simon dismissed her. Now Jesus makes the message of this parable really pointed, by comparing the unnamed woman and Simon. ‘I entered your house; you gave me no water for my feet, but she has bathed my feet with her tears and dried them with her hair. You gave me no kiss, but from the time I came in she has not stopped kissing my feet. You did not anoint my head with oil, but she has anointed my feet with ointment.’ Even though Jesus was a guest in Simon’s house, it’s the woman who offers hospitality. The woman’s demonstrative and extravagant expression of devotion shows her acceptance of Jesus’ unconditional invitation to share the love and forgiveness of God. Simon’s conduct, in contrast, is merely formally correct and shows an unwillingness to embrace Jesus’ offer of the kingdom. In part, the difference between Simon and the woman may be connected to their different levels of awareness of their own need. The woman knew she was a sinner, and so responded to her forgiveness with great love. Simon the Pharisee didn’t seem to feel sinful at all, and so responded with little love to Jesus’ message. We’re all sinners together and all our sins, big and small, are forgiven by God. This is the new community, where murderers and terrorists and drug-dealers are as welcome as gossips and those who fiddle their taxes. We’re all forgiven; we’re all able to start again and show great love. Today’s story speaks not only about our forgiveness by God, but also about how we can forgive others. The parable suggests that God’s acceptance and forgiveness of the woman came first, and her response of love followed. She isn’t forgiven because she shows great love; she shows great love because she has been forgiven. As John Wesley wrote: ‘It should carefully be observed here, that her love is mentioned as the effect and evidence, not the cause of her pardon. She knew that much had been forgiven her, and therefore she loved much.’ In God’s kingdom, forgiveness precedes signs of love. It’s not something to be earned. I’ve had lots of discussions with people about forgiveness over my years in ministry, because forgiving others is one of the most difficult parts of living as Christians. It’s central to our faith; every time we pray together we ask God to forgive us our sins, as we forgive those who sin against us. Is it possible for us to forgive others as God forgives us? We’d better hope so, or never pray the Lord’s Prayer again. But it’s hard. What today’s story tells us is that God’s forgiveness, to which we add our own signature, happens even before a sinner seeks repentance. People talking to me about forgiveness have told me that it’s hardest when the person who has sinned against them doesn’t acknowledge their sinning; doesn’t express remorse or repentance. In those circumstances forgiveness might seem impossible. But it’s not; because God has already forgiven and we are able to make God’s forgiveness our own. We’re able to forgive, and experience the relief and freedom that comes from that, even before the person who has sinned against us and against God seeks repentance. Remorse isn’t necessary; although we can hope that everyone who is forgiven responds with great love! This entry was posted in Sermons, Uncategorized and tagged forgiveness, Luke 7:36-8:3, Sermon. Bookmark the permalink.